We’d love your help. Let us know what’s wrong with this preview of The Snurtch by Sean Ferrell. From the team behind I Don’t Like Koala, this clever picture book takes a discerning look at the challenges Some days are Snurtch days. Ruthie is having one of those. To ask other readers questions about The Snurtch, please sign up. An excellent, entertaining, easy-to-relate-to metaphor for grumpiness, anger, fatigue, lack of focus, and all the other moods that can overtake young kids and be difficult to understand and control. Delightfully told and illustrated, this book will comfort, entertain, and elicit loud guffaws of laughter! I have a Snurtch. We all have Snurtches, but some of us have bigger ones than others. This is a wonderful tale that will help children who may have ADHD or other behavioral issues see that they are not alone with their problems, that they're not inferior, and maybe even help them learn to cope with them. This is not an instructional book, however, and that's to it's benefit--every child will enjoy following along with this fun and silly story and be entertained as well as learn from it-- what mo I have a Snurtch. We all have Snurtches, but some of us have bigger ones than others. This is a wonderful tale that will help children who may have ADHD or other behavioral issues see that they are not alone with their problems, that they're not inferior, and maybe even help them learn to cope with them. 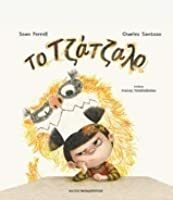 This is not an instructional book, however, and that's to it's benefit--every child will enjoy following along with this fun and silly story and be entertained as well as learn from it-- what more could you want from a great picture book? Highly recommend. A snurtch is Ruthie's problem at school and it seems to be a growing problem. Interesting story and illustrations are colorful but couldn't tell if it was Ruthie, or her imagination that was the snurtch until the end when they all developed one. The illustrator was very imaginative. Ferrell’s book offers a platform for discussing those moments when we are not at our best. It is much easier to assess our own actions if we can blame our poor choices on a Snurtch, an Whether you are 5 or 50, we all have a Snurtch that we must contend with and control. 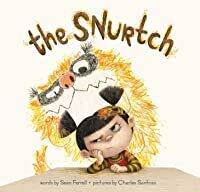 In Sean Ferrell’s THE SNURTCH, Ruthie is struggling to manage her Snurtch, a wonderful personification of her bad temper and poor behavior. Ruthie’s Snurtch causes big trouble at school...trouble for which Ruthie takes the blame. This is my favourite picture book this week! The Snurtch describes perfectly those angry, grumpy, rotten feelings that can surprise us all. The illustrations are just perfect as well, they add visual understanding and a touch of humour while being beautiful as well. LOVE. This would be perfect to read-aloud to children just starting school. An excellent approach to discussing emotion and behavior without being heavy-handed. The illustrations are brilliantly done with a fantastic contrast between the imaginary Snurtch and the characters. This is an interesting story that makes one think, do I have a cranky Snurtch like Ruthie does? The Snurtch represents rudeness and bad attitude and uncontrolled emotions - which we all have at one time or another. Great illustrations. Like 3.5...sounds like ruthie needs some discipline! Dang, so that is what it is called? A Snurtch! Amazing illustrations. The eyes are a bit spooky; glass-like a dolls' eyes. You can feel this childs' emotions. A very fun book. Kids will probably love this book - the drawings, monsters, misbehaving children. I hope they embrace it as a silly monster story or they read it with an adult who can explain it in context. Because on a deeper level, this book bothered me. The little girl does mean, bratty things and it gets explained away as her invisible monster Snurtch. It is HIS fault she stole the crayons. I sort of get where that is coming from, we all act out and have bad moments, blah-blah-blah. I ge Kids will probably love this book - the drawings, monsters, misbehaving children. I hope they embrace it as a silly monster story or they read it with an adult who can explain it in context. Because on a deeper level, this book bothered me. The little girl does mean, bratty things and it gets explained away as her invisible monster Snurtch. It is HIS fault she stole the crayons. I sort of get where that is coming from, we all act out and have bad moments, blah-blah-blah. I get that. But for kids to blame their bad behavior on an imagined monster LIVING INSIDE THEM...just doesn't strike me as mentally or emotionally healthy. Kids need to learn responsibility for their actions/emotions. Not blame it on a Snurtch. I tried to relax and accept it as a harmless story but then I turned to the final page. An illustration of a classroom filled with cute kids calmly doing schoolwork...surrounded by their "imaginary" monsters. Lurking on their shoulders, sitting on their desks, stroking their hair. Just waiting to possess the unsuspecting victims and release chaos. That's just plain creepy. And not in the fun way. Ruthie is having some trouble at school. It's not because of her schoolwork, not because of her classmates, it's the snurtch. It seems all that the snurtch wants to do is get Ruthie in trouble at school; whether it be throwing pencils, making rude noises, or ruining her classmates artwork. Ruthie finally decides enough is enough, and shares with the class her drawing of the snurtch, explaining that it's the one causing her to get in trouble. After sharing this with the class, the snurtch still h Ruthie is having some trouble at school. It's not because of her schoolwork, not because of her classmates, it's the snurtch. It seems all that the snurtch wants to do is get Ruthie in trouble at school; whether it be throwing pencils, making rude noises, or ruining her classmates artwork. Ruthie finally decides enough is enough, and shares with the class her drawing of the snurtch, explaining that it's the one causing her to get in trouble. After sharing this with the class, the snurtch still has its troublesome moments, but it learns to control itself a little better. By the end of the book Ruthie realizes that she's not alone, everyone has their own snurtch that they have to deal with. Activity: Have a brief discussion with the kids as to what the snurtch represents, our troublesome thoughts and behaviors. Each of the kids can use crayons to draw their own snurtch on a piece of paper. What does it look like? What sort of trouble does their snurtch get into? The kids can share their snurtches in small groups and explain what their snurtch does. The Snurtch is about a little girl named Ruthie who has a Snurtch follow her around all day. This Snurtch makes her blurt out, tear other students artwork and do other rude things to her classmates. When her teacher tells her to stop doing the rude things she is doing, Ruthie blames the Snurtch. During an art project Ruthie draws her Snurtch and shares it with her classmates. Her classmates recognize the Snurtch as the one who has been doing all of those rude things. Ruthie finds out that everyone has a Snurtch, it's just learning how to control it. This would be a good book to use when teaching kindergartners about the rules. Start by reviewing or teaching the rules on the board. Next read the book. Ask the students what are some of the things the Snurtch made Ruthie do and what rules was she breaking. Finally have the students draw their own Snurtch and then post their pictures next to your rules poster. Ruthie is a spunky girl who has difficulty behaving in school all because of “the Snurtch.” It makes her scribble, and takes her seat so she can’t sit down, and burps in class among other obnoxious things. When given the chance to draw in art class Ruthie draws a picture of her Snurtch and all of the other kids identify with her drawing. They all have a Snurtch of their own. It’s a fun twist on learning to turn misbehavior into positive behavior with a little understanding. Activity: If you had a Ruthie is a spunky girl who has difficulty behaving in school all because of “the Snurtch.” It makes her scribble, and takes her seat so she can’t sit down, and burps in class among other obnoxious things. When given the chance to draw in art class Ruthie draws a picture of her Snurtch and all of the other kids identify with her drawing. They all have a Snurtch of their own. It’s a fun twist on learning to turn misbehavior into positive behavior with a little understanding. Activity: If you had a Snurtch what would it look like and do? Draw your own Snurtch. Explain how your Snurtch misbehaves and how you can get it to behave instead. Share your Snurtch with the class and tell what it does and what you do. Hang the pictures on the wall so students can see other Snurtch's and as a teacher you can use the students ideas as a teaching opportunity to reinforce good decisions and behavior choices. Ferrell, S. (2016). The Snurtch. New York, NY: Atheneum books for young readers. Summary: This one little girl named Ruthie has a problem in school but it is no ordinary problem. Her problem is that she has a Snurtch and this snurtch makes her do bad things even when she doesn't want to. One day in class, they were drawing something and she drew her and the snurtch and finally stood up to him. Her snurtch still does bad things but is also sorry sometimes. She came to the conclusion that other kids have their own snurtch. Activity: Have the children draw their own snurch and a Summary: This one little girl named Ruthie has a problem in school but it is no ordinary problem. Her problem is that she has a Snurtch and this snurtch makes her do bad things even when she doesn't want to. One day in class, they were drawing something and she drew her and the snurtch and finally stood up to him. Her snurtch still does bad things but is also sorry sometimes. She came to the conclusion that other kids have their own snurtch. Activity: Have the children draw their own snurch and ask them what things he/she does that is bad. Make sure you explain what bad things this Snurtch makes you do and why you think the Snurtch makes you do those things. Do you think that those actions are wrong and what can you do to change those actions? Ruthie is a girl who has a problem at school. That problem does not have anything to do with school or the students, it has to do with the Snurtch. The Snurtch is constantly getting Ruthie into trouble and makes it very hard for Ruthie to concentrate during school. However, Ruthie finally finds a way to put an end to the Snurtch's mayhem, but how? I think it would be fun to have all the children draw their own Snurtch after reading the book. Then I hang them up around the classroom for everyone to see what everyone's Snurtch looks like. I think this would be a different and fun activity for the children and would really get their imagination going. Ferrell, S., & Santoso, C. (2016). The Snurtch. New York: Atheneum Books for Young Readers. I've read this to every class this week. It really gets them talking and thinking. But we all agree, we all have a Snurtch. And when that Snurtch acts up then we have to say we're sorry. I think every teacher wants a copy in their classroom. I started reading it to my older students but the most receptive students were the three year olds. "Hey, everyone has a Snurtch!" said one little guy. Another said, when we looked at Ruthie's drawing, "Ruthie is the Snurtch!" And then we all talked about wha I've read this to every class this week. It really gets them talking and thinking. But we all agree, we all have a Snurtch. And when that Snurtch acts up then we have to say we're sorry. I started reading it to my older students but the most receptive students were the three year olds. "Hey, everyone has a Snurtch!" said one little guy. Another said, when we looked at Ruthie's drawing, "Ruthie is the Snurtch!" And then we all talked about what color our own Snurtch was. This book is so great. Ruthie hates school - not because of the people or the work, but because her Snurtch is always there with her. He throws pencils, he destroys George's artwork, and he makes weird noises at recess. The Snurtch is the personification of Ruthie's emotions coming out. When she's unable to control herself, it's the Snurtch. She soon realizes that others have one too. This is a fun and engaging picture book that many young readers will be able to relate to. "Ruthie has a problem at school. It is not the students. It is not the classroom. It is not the reading or the writing or the math. It is the Snurtch." All sorts of misbehavior is due to Ruthie's Snurtch. Everyone has there own Snurtch. Acknowledging it seems to be the first step towards getting it under control. The digital illustrations are adorable. My favorite part was when all the kids realized that the Snurtch was the one causing all the trouble in the classroom. I wonder about the coping mechanism of needing an outside thing to blame as opposed to accepting responsibility for one's own actions. Yet each child found they had their own Snurtch and drew a picture of it, so I suppose that resolves it. What a wonderful book to explore what it means to have negative emotions as a child. Will be reading at my next storytime. Great to open conversation about controlling emotions/impulses. Puts a kid-friendly name to it & story shows kids they are not alone, that everyone has their own snurtch! Some days are snurtch days. Yup, I totally get that! And now I know what to call those pesky days. 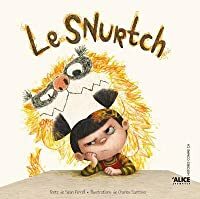 The Snurtch is about a girl named Ruthie who has a Snurtch who follows her around school and makes it miserable for her.The Snurtch makes her do rude things and be mean to others. I draws on her neighbors paper and does a lot of other mean things. One day in art class Ruthie is finally able to draw the snurtch and she shares in front of everyone. Once she shares about her Snurtch, she realizes that she is not alone and that everyone around her has a Snurtch. I do not know how I could use this in The Snurtch is about a girl named Ruthie who has a Snurtch who follows her around school and makes it miserable for her.The Snurtch makes her do rude things and be mean to others. I draws on her neighbors paper and does a lot of other mean things. One day in art class Ruthie is finally able to draw the snurtch and she shares in front of everyone. Once she shares about her Snurtch, she realizes that she is not alone and that everyone around her has a Snurtch. I do not know how I could use this in the classroom. However, I do see how this could be used in a therapy session when talking about anxiety. I feel as though the Snurtch is a metaphor for anxiety or other things that distract you from being who you truly are. Then once you talk about your anxiety in front of people you realize that you are not alone and that a lot of people are going through someting similar. An activity could be having kids write down things that they are scared to talk to other about. Ferrell, Sean The Snurtch, illustrated by Charles Santoso. PICTURE BOOK. Antheneum (Simon & Schuster), 2016 $17.99. Ruthie's got a problem. There is a Snurtch that keeps getting her into trouble at school. It throws pencils, makes rude noises, and forgets questions. It even tears up others drawings in art class. Ruthie, decides she has got to do something about the Snurtch. She focuses really hard and begins to draw the Snurtch. She even shares her drawing with the class so they can see the Ferrell, Sean The Snurtch, illustrated by Charles Santoso. PICTURE BOOK. Antheneum (Simon & Schuster), 2016 $17.99. Ruthie's got a problem. There is a Snurtch that keeps getting her into trouble at school. It throws pencils, makes rude noises, and forgets questions. It even tears up others drawings in art class. Ruthie, decides she has got to do something about the Snurtch. She focuses really hard and begins to draw the Snurtch. She even shares her drawing with the class so they can see the Snurtch too. Then very bravely, Ruthie apologizes for her bad behavior and tries to do better at controlling her inner Snurtch. This is a great story for teaching children about appropriate behavior in school. When Ruthie realizes all the children in her class have a Snurtch of their own that they struggle with, it lets her know she is not alone. Children will love the illustrations and the book will spark a great discussion about good behavior strategies for being successful in school. Ruthie has a problem at school called the Snurtch. He is always messing with her classmates and getting her in trouble. One day she draws the Snurtch and shows her classmates and they say thats who has been bothering us. They all love her drawing. She no longer worries about the Snurtch because it turns out everyone has a Snurtch. I thought this book was very cute. The illustrations in this are so good!! I love how he mixes cartoon characters with drawn characters. It was a bit hard to follow th Ruthie has a problem at school called the Snurtch. He is always messing with her classmates and getting her in trouble. One day she draws the Snurtch and shows her classmates and they say thats who has been bothering us. They all love her drawing. She no longer worries about the Snurtch because it turns out everyone has a Snurtch. I thought this book was very cute. The illustrations in this are so good!! I love how he mixes cartoon characters with drawn characters. It was a bit hard to follow the story though because it is talking about an imaginary creature, but it doesn't ever come out and say it's imaginary. This book is about a child named Ruthie who has this thing call a snurtch that bothers her and her classmates. It makes pencils fly across the room and it scribbles all over a classmates paper. It sits in Ruthie's seat and it makes her burp and laugh loudly. Everyone in the class has a snurtch but no one knows how to control it. I love this book because I feel like it sheds light on whats going on in some students heads. They know whats right and wrong but sometimes they just can I love this book! I love this book because I feel like it sheds light on whats going on in some students heads. They know whats right and wrong but sometimes they just can't resist from doing wrong. I also feel like this could connect to all students, students with behavior disorders, students with bad home lives and people with social or personality disorders.